Document your company history in the context of Indian industry. Our writers understand your vision and your situation, listen to your anecdotes at levels across the organization, and present these along with an analysis of trends and figures to create a gripping narrative. Sandvik, a multinational engineering group headquartered in Sweden, began its Indian operations in 1960, on the invitation of the Government of India. 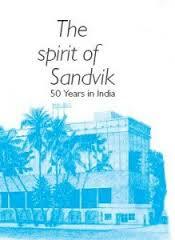 The Spirit of Sandvik (published 2010) traces the 50-year history of Sandvik Asia. Along with company-specific anecdotes, you will also read here the history of a determined and ambitious nation that started with nothing and how it grew to become one of the world’s advanced manufacturing and high-technology countries.